Sen. Susan Collins shares answers she got from an expert on how increasing focus on geriatric care could reduce some health care costs. WASHINGTON — Sen. Susan Collins attended a Senate Health Committee hearing Wednesday where she asked Dr. Katherine Bennett, an assistant professor at the University of Washington School of Medicine, how an increased focus on geriatric care could reduce health care costs and increase the geriatric workforce. 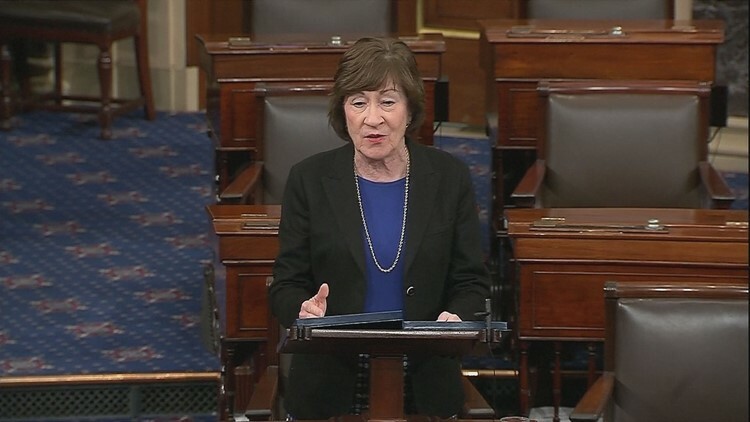 A spokesperson for Collins said the senator questioned Bennett on how a healthy geriatric workforce will increase the affordability of health care. “[Geriatric care] can prevent falls. We can keep people living independently in their homes by [taking] good care of people with dementia, helping support their chronic diseases. Geriatrics is just made to save money,” Bennett said. Research that has been conducted on geriatrics training is related to cost saving health care. “As a result, older adults suffer from preventable falls; preventable delirium (confusion) in the hospital; undertreatment of important conditions (such as osteoporosis); and overtreatment with medications and other interventions that do not improve their health, quality of life, or ability to maintain independence,” Bennett said. Collins' office said the bill would reauthorize the Geriatrics Workforce Enhancement Program (GWEP) at $45 million per year over the next five years and also reinstate the Geriatrics Academic Career Awards program (GACA) at $6 million per year.